Technology will be a major differentiator for financial institutions that are either accepted or left in the dust as the younger generations continue to enter the workforce. There has been a lot of research and discussion about how many millennials “prefer” innovations such as online or mobile banking. Generation Z not only prefers this technology, but expects it. Any parent knows how difficult it is to take cell phone privileges away from a teenager (or even ask to borrow the phone for a few minutes to make a call). Imagine telling that same teenager who will soon be out of college that he/she can’t use that phone to do personal banking. Then try to guess the odds you will not lose that (potential) member to another institution that better meets his/her needs. It is important to note that online or mobile banking is not a simple fix to be accepted by the upcoming generation. 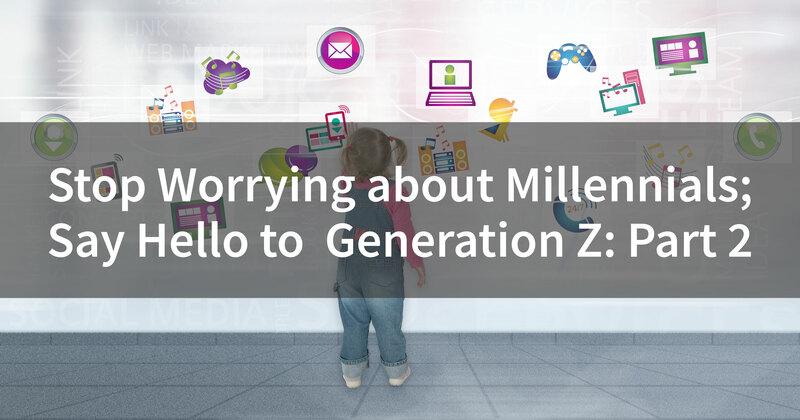 As previously mentioned, Gen Z has expressed increased concerns over topics such as security and privacy before they even own any assets. A fancy website might keep Generation Z interested long enough to learn more, but you need to have offerings to back it up. Similar to the millennial generation, the experience matters. Generation Z is more likely to seek out their own information for purchasing decisions than be swayed by a piece of advertising that they somehow couldn’t skip, block, or filter out. They are the best generation to date at comparing options online. They have grown up with high-speed access to answers about any question, and reviews on any purchase they are looking to make. It has never been easier for people to compare their options on their own with a few clicks in a few seconds, and that will be the make-or-break point in capturing the members of Gen Z. You will need to continue to build and strengthen these relationships in order to maintain Gen Z as a member or customer. Banks and credit unions need a way to capture and utilize all available data in order to reach and relate to this generation. For example, if a marketing message isn’t personalized for them, you are already behind the curve of every other business they are regularly interacting with, like Amazon, Uber, or even big banks, who intimately know these customers through the data they are collecting. Credit unions and banks are fortunate to have access to a lot of information about their members, but need to take advantage. Financial institutions need to make their data actionable – show your members that you understand their needs and want to help them reach their goals. This type of insight requires integrating all available sources and doing some advanced analytics, but will only be more and more necessary as we face younger generations. Millennials may have been a nice yellow flag for financial institutions to catalyze change, but the next tidal wave of generational demand will be much, much greater, and your financial institution has no time to waste. Keep up with the latest in analytics and credit unions - Click here to subscribe.